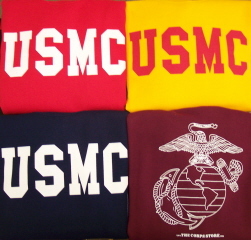 USMC crew neck sweatshirt available in red, navy blue, and maroon with white ink; sizes range from small - 3XL. The sweatshirt is also available in gold with red ink and sizes range from small - 3XL. The sweatshirt has a large Eagle, Globe and Anchor on the back. ** New ** Select an Olive Drab sweatshirt with USMC in pink ink or black ink. And a gray sweatshirt with USMC in black ink. All three new designs have the Eagle, Globe, and Anchor on the back and are available in small - 3Xlarge.